Vans - 50 year anniversary. 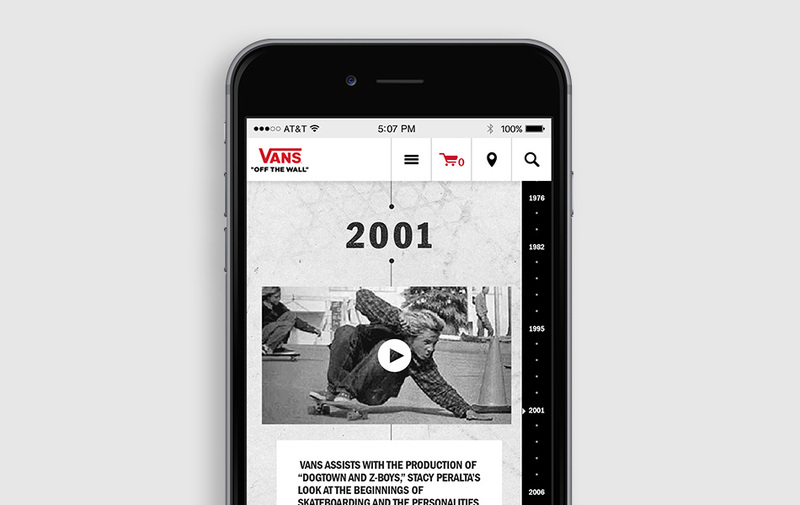 Vans partnered with Cuker to launch a mobile-first interactive timeline showcasing big moments in the brand's history over the past 50 years. 2016 marks the celebration of Vans' 50th anniversary. Beginning as a core skate brand with footwear purpose-built to handle the wear and tear of the skateboarding, Vans has since established itself broadly as a hallmark in the wardrobe of youth globally. We were tasked with envisioning an interactive web timeline experience to act as the digital hub for the anniversary campaign. The goal of the website was to take visitors on a journey through the significant events, achievements and milestones that have propelled Vans to become a dominant global footwear brand and cultural icon. Because a significant portion of Vans' web engagement occurs through smartphones, we took a mobile-first user experience design approach. With over one hundred static and rich media timeline elements, the challenge was to develop the appropriate navigation strategy. To reduce friction and allow for power browsing, we incorporated a right-navigation feature that enables visitors to toggle between different parts of the page - skipping years and decades to avoid over-scrolling. Using cutting-edge responsive design technology, we launched an engaging mobile and desktop experience - creating an evergreen home for the brand's history.